I’m not sure if I made up that name or not, wine bottle olla, or if it’s even a real “thing”… it’s just what I call them. I’ve been collecting and using them now for a couple of years. It’s a really simple concept, you take an empty wine bottle, fill it up and jam it in the ground, but there are some things that I’ve found that make the whole thing work better. First, the color. Fortunately we drink more red wine around here, which comes in the darker colored bottles. The darker color cuts the amount of sunlight that hits the water and so you don’t get algae in the bottle. I have not had an issue with algae in any of my darker bottles. Clear bottles or even lighter colored bottles on the other hand, tend to get algae in them pretty quickly. Avoid clear, go for dark. Brown or green is fine. The second one has to do more with a preference due to my method for filling the bottles. I’ll gather four bottles at a time, take them over to a 5 gallon bucket that is full and constantly being filled (slowly) by the hose. I’ll force all four bottle down at once into the bucket. This seems to be the fastest way to fill the bottles and so the quickest way to complete my morning chores and get to work. I’ve found that the taller wine bottles make this tough. Shorter, fatter, wine bottles make this much easier. I’ve also found that the shorter, fatter, bottles are more stable and less likely to tip over and push up the dirt around your plants. To start the whole process I water everything. This moistens the soil which means the water won’t be running out of your bottles as soon as you turn them over. The whole idea is that the bottles will help maintain moist soil. This also helps if the bottles have any kind of lip to them. 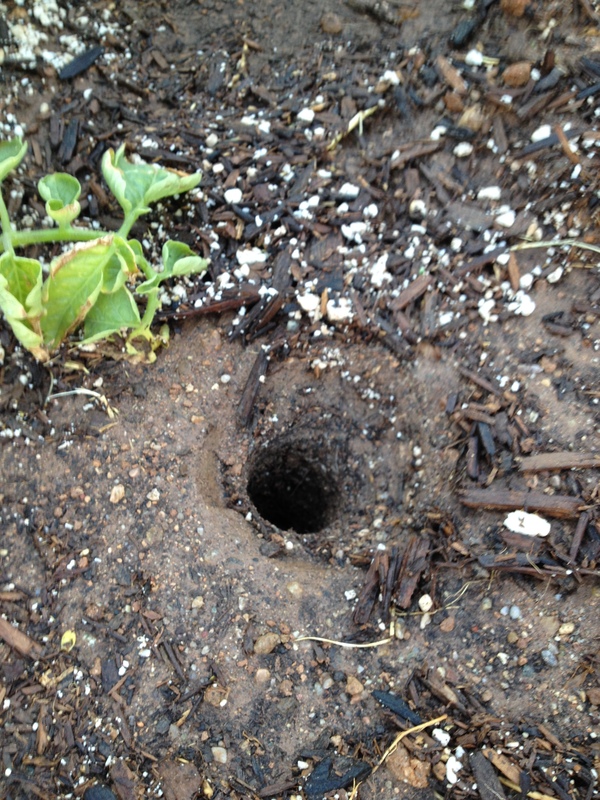 The lip has more of a chance of grabbing the soil if the soil is dry and making a mess of the hole. 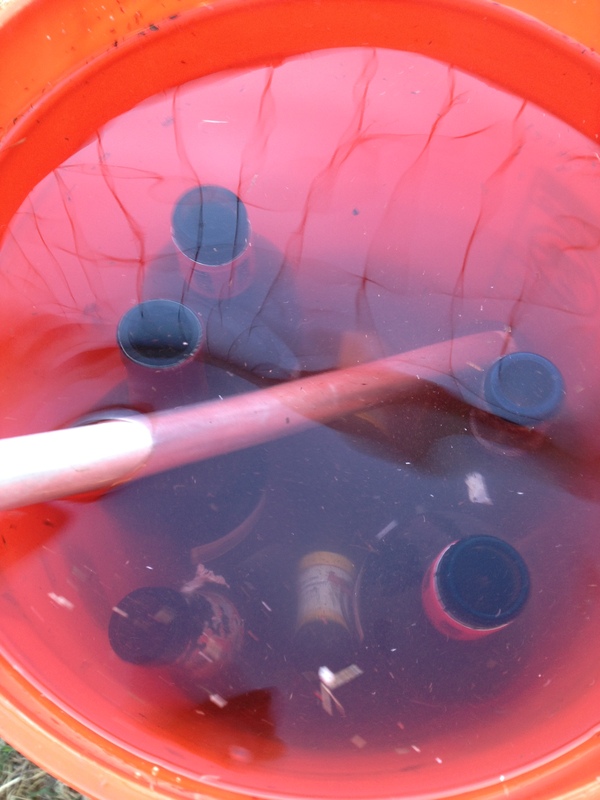 After the ground is wet, I simply pull the empties out, fill them, then put them back into the same holes. I’m not really concerned if the same bottle goes into the same spot every time, unless it’s some odd shaped/sized bottle to begin with, but I use the same hole and don’t create new ones. If I’m putting a bottle in for the first time I space the bottle away from the plant a reasonable distance. The smaller the plant the closer I put the bottle, mainly because the roots of the plant will be closer and so you have less chance of damaging the roots. 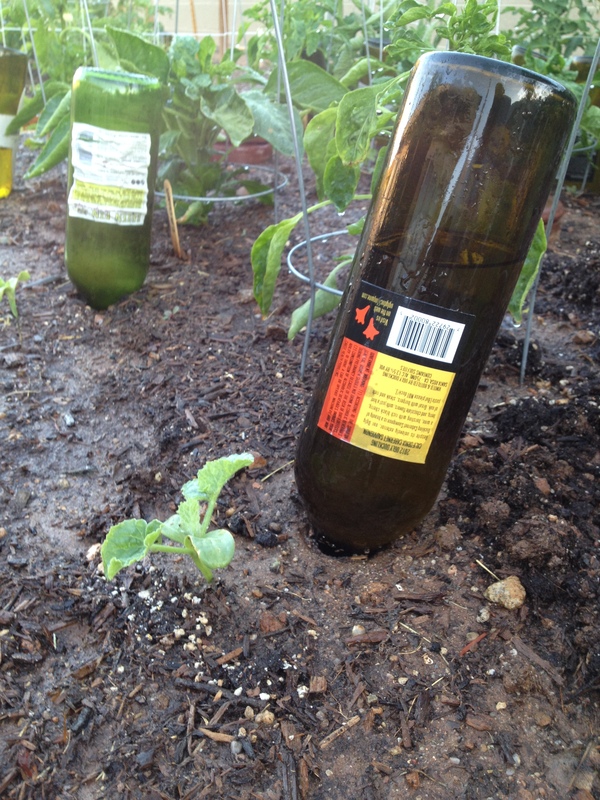 If you jam a bottle into the ground close to a large plant you have more chance of damaging roots. Damaged roots are bad, let’s not go there, buddy. I place the bottle at a slight angle, so that the opening of the bottle is pointed at the roots of the plant. Too much angle and the ground may not hold the bottle up. Too vertical and for whatever reason the water may just end up staying in the bottle. You get a slight better flow if you angle the bottle. When you first put the bottle in you should see a couple of bubbles. If you have nothing else to do then you can sit there and watch the bottle for a few minutes and you’ll notice the occasional bubble. Bubbles (air) come in, water goes out. That’s about it! Now if you live in a place where you get… rain, this is probably a slight waste of time. 🙂 But if you live somewhere like AZ where you get less than 10 inches of rain a year and the humidity level can drop into the single digits, it just might come in handy. Posted in the Homestead Barn Hop. 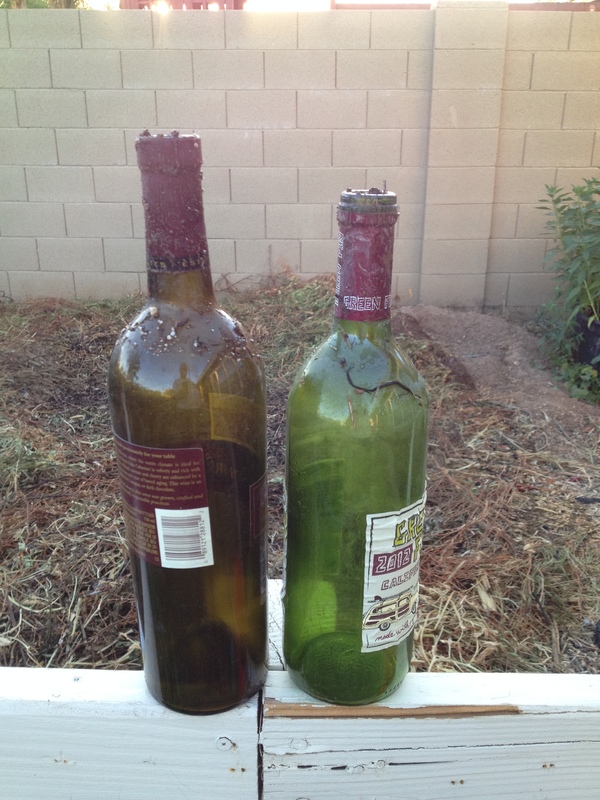 This entry was posted in Arizona Garden, wine bottle ollas. Bookmark the permalink. Thanks for the great post. I’m going to try it during the summer. Thanks, I’d love to know how it works for you. It will be much easier when I go back to Kentucky-hardly ever have to water the garden there. And never water the grass-just cut it-a lot! Yah, big difference between 53 inches of rain a year and 9. Thanks for sharing the details of this. I’m looking forward to giving it a try! You’re welcome, please let me know how it works for you. Thank you for this! I recycle a fair amount of red wine bottles but now I know what I can do with them! I will definitely be using this here in Texas, and later on when I move to Mesa to be with family. I need to pass this idea on to my brother who lives in Mesa.